Jesper Falkheimer (Ph.D., 2004), is Professor in Strategic Communication at Lund University, Sweden. . Since several years he has combined research with management positions and is Executive Director for Division for Research, Collaboration and Innovation at Lund University, after six years as Rector for Campus Helsingborg. He is Editor-in-Chief for Journal of Communication Management and Honorary Fellow at Hong Kong Polytechnic University. 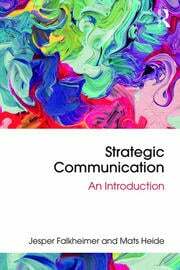 Jesper Falkheimer (Ph.D. Lund University, 2004), is Professor in Strategic Communication at Department of Strategic Communication, Lund University, Sweden. His research interests are strategic communication in general, and more specific, crisis communication, public relations, communication management, terrorism and place branding. Since several years he has combined research with university management positions and is now Executive Director for Division for Research, Collaboration and Innovation at Lund University, after six years as Rector for Campus Helsingborg, and two assignments as head of department. He is Editor-in-Chief for Journal of Communication Management, one of the leading research journals in his field, Honorary Fellow at Hong Kong Polytechnic University, an executive board member of one of the major communication agencies in Sweden and director for the premium executive education program for communication professionals in Sweden, based at the Swedish Communication Association. He is also an executive board member of University College of Halmstad, Sweden. He is co-editor (main editors Robert Heath and Winni Johanssen) for International Encyklopedia of Strategic Communication (2018, Wiley) and has published several books, anthologies and articles in different journals.